The creation of Vionic shoes started with an Australian podiatrist named Phillip Vasyli. Vasyli has experience treating thousands of patients in all ages groups and backgrounds. Early on in his career, Vasyli noticed that treatment for common foot issues such as over-pronation and plantar fasciitis proved very costly. He wanted to come up with a solution to these problems that would help his patients prevent some of these issues and feel better on their feet. This is when he came up with an award-winning orthotic that would be available to the public without a doctor’s prescription. This invention allowed for the creation of Vionic shoes which are not only stylish, but also alleviate foot related pain. Vionic shoes are designed to fit to your foot’s arches as if they were a natural footprint, allowing your feet to have tremendous support. The shoes are created with an Orthaheel technology that is specifically designed with a deep heel cup in order to enhance stability and provide arch support with a firm, flexible midsole. This Orthaheel technology will provide you with proper alignment, which will help reduce aches and pains you may be experiencing. There is a Vionic shoe for any type of activity you may need to do throughout the day. From slippers and flats, to sneakers and sandals, there isn’t a category that Vionic hasn’t already designed a comfortable shoe for. 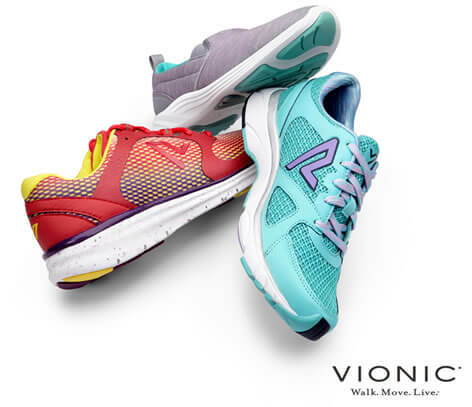 This wide range of a shoe line makes Vionic a more suitable footwear option for those who suffer from foot-related pain while being stylish as well. At New Tampa Foot & Ankle we are proud to offer Vionic shoes. Our podiatrists will help you pick out the best shoe for your personal needs.